Despite having only revealed 6 pictures on my Kylie Minogue calender so far, I may already have a candidate for Best Bird of the Year. The Great Grebe, Podiceps major, is a bird of South America where it frequents large waters and coastline on both sides of the continent. From southern Brazil on the east coast, it extends down through Uruguay and Argentina as far as the cape. 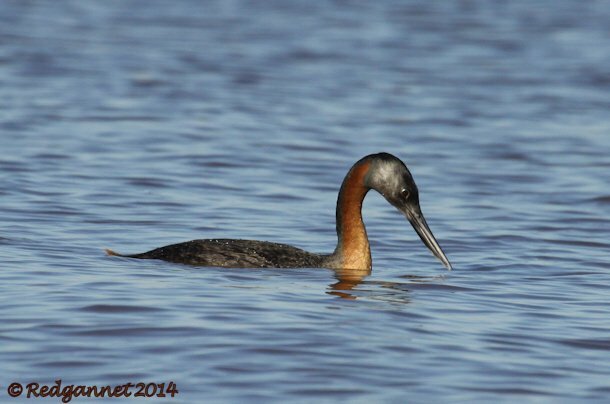 The nominate is found to the west in Chile with a separate population in NW Peru. It prefers large waters and coasts during the non-breeding season, but seeks out wooded, well vegetated lakes and marshes for breeding. And did I mention that it was big? 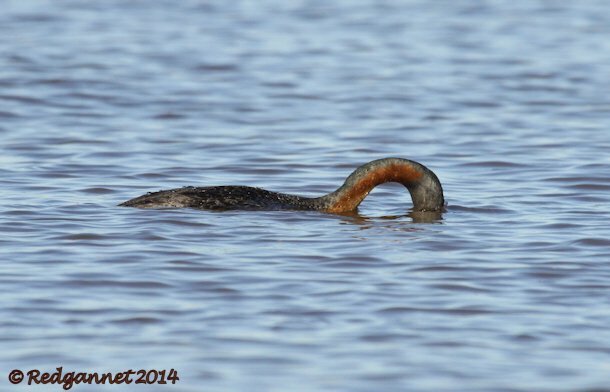 True to its name it is the world’s largest grebe. It is a common bird and easily seen if you are in the right place at the right time and they can be quite social. Non-breeding birds form together into flocks, while breeding birds sometimes seek protection by nesting in loose colonies. 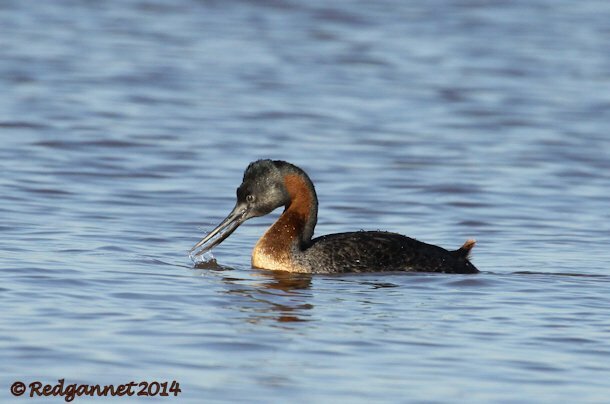 Until now our narrow cross-over had not coincided, but on a recent trip to Buenos Aires, I was delighted to get close views from the rubble beach at Costanera Sur as a single bird fished close to the shore. The local Buenos have a custom to gather on the shoreline on weekend evenings. Hundreds of people were already enjoying the late afternoon sunshine while many more were making their way through the reserve to congregate at the picnic area overlooking Rio Plata and the South Atlantic Ocean. The grebe was feeding close to the shore and was not at all disturbed by the throng of people, so I was able to pull up a boulder on the water’s edge and enjoy the show. The light was perfect, coming from behind me and showing off the subtleties of colour that would have been missed in dull conditions. The rufous marking on the side of its neck and its breast stood out from the charcoal nape and the slate-grey head was very noticeable as it turned towards me. In the way of diving birds everywhere, it flattened its feathers and pushed out all the air before gracefully sinking beneath the surface. 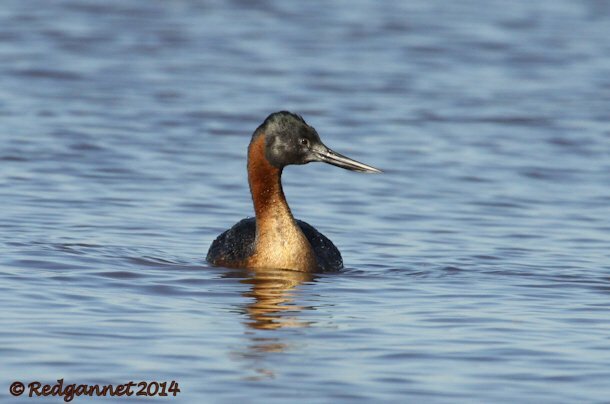 Unlike many other diving birds that make an extravagant leap before submerging, the Great Grebe demurely lowered its head to the water and slipped beneath the surface. 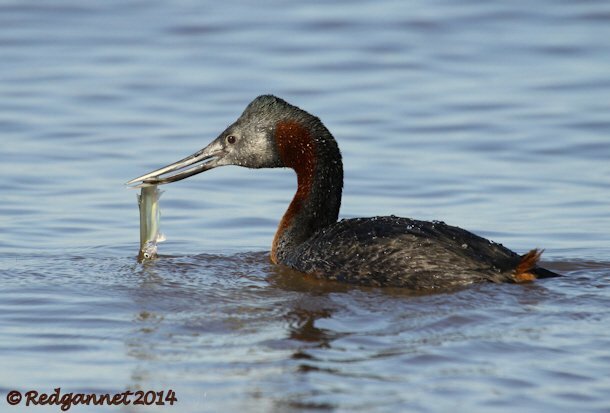 It caught a couple of fish as I watched and swallowed them without ceremony before diving down for more. 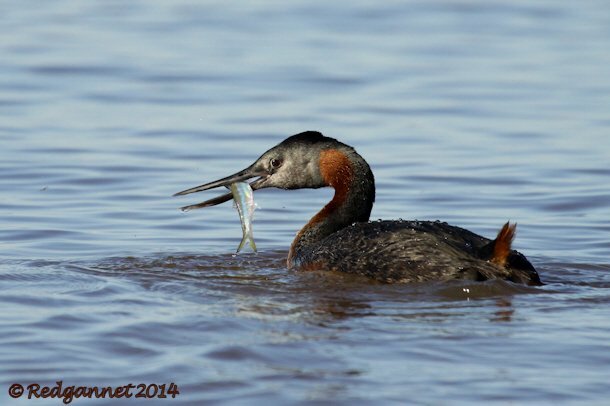 They will take crabs and shellfish during their winter sojourn along the coast and may take chicks from water-nesting birds during the breeding season, but fish is the year-round staple as one might expect of a grebe. Fabulous photos! Thanks for a great post! I got my BOTY before breakfast on the 1st of January! But that is a sweet bird! 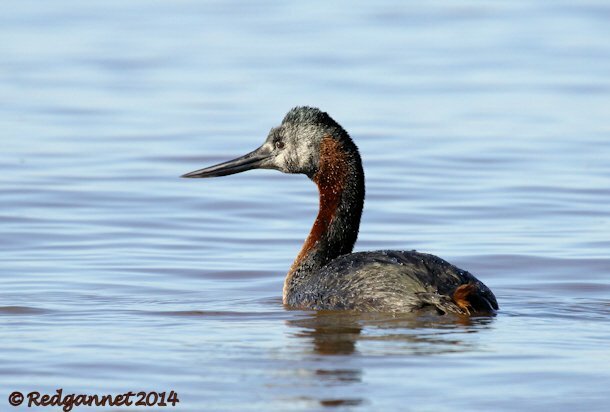 Not a grebe I’d heard of, so thanks for sharing it. I have to admit, I keep looking and thinking Great Crested minus the crests though! A wonderful melding of light, bird, and birder. Sounds like it was a real scene on the beach too.